We are aware of how hard it is to choose a single destination for your vacation in the Canary Islands (Spain), yet looking at the diverse attractions of Tenerife, it might be the perfect choice for your next holidays if you love exotic views, volcanic landscapes, hiking tours, fine gastronomy, heavenly beaches and all-inclusive resorts. What is more, the main advantage of a trip to Tenerife is that locals and visitors alike enjoy its nice weather all year round, along with the fact that one can alternate long days sunbathing by the hotel pool with, for instance, excursions to the highest Spanish peak: Mount Teide. Where to stay in Tenerife? Find our recommendations below. This 3-star hotel in Tenerife offers sensational views to ocean as well as to the Orotova Valley. Staying in this specific place makes it easier for travellers to disconnect, since we are talking about a quiet area surrounded by whimsical tropical gardens. The perks of being a guest here also include sleeping within walking distance to Puerto de la Cruz downtown and its bus station, town hall, casino, restaurants, shops and supermarkets. The popular “Loro Park” is just 1,8 kilometres away and Tenerife-North airport is barely 21 km away. Likewise, travellers may walk to the beach or the nearby Lago Martiánez after indulging in the delicious buffet breakfast or the international and local dishes of the onsite restaurant. The Elegance Miramar Hotel in Tenerife offers all-inclusive rates or breakfast-included rates for their single, twin, double, triple and family rooms. Access to the pool and the library is free all throughout the year, and other extra features like daily cleaning service and luggage storage are offered at no cost as well. Probably one of the best hotels in the Canarian Islands, this luxury establishment is part of a larger resort, known as the Mare Nostrum, which is located in Las Americas beach in Tenerife. Guests particularly like their organised activities, the poolside bar, the convenient location and the healthy and varied food selection. 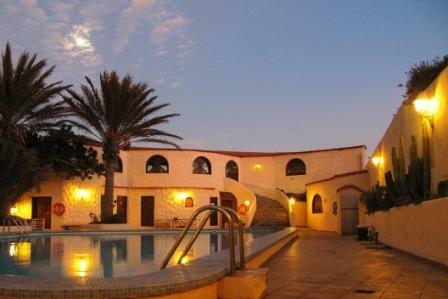 To top it all off, the hotel has a fitness centre, a Spa, sports courts and a large open-air swimming pool with sunbeds. When booking a room at the Mediterranean Palace in Tenerife, you will be able to choose among units that can accommodate couples or families and feature sea, pool or mountain views. All rooms have a balcony, air-conditioning and TV with satellite channels. Aquatic parks like Siam Park and Aqualand can be reached after a short drive from the establishment, and Tenerife South airport is only 15 kilometres away. The staff will gladly assist you by providing information on how to get around. Also rated 5 stars, this hotel in Tenerife is found in the municipality of Guía de Isora, and a short stroll separates it from the coast. Its privileged location offers guests the possibility to admire the beauty of the Atlantic Ocean and La Gomera island in the distance. Its luxury premises encompass ten restaurants, seven swimming pools, a wellness centre, tennis courts, a golf course and a private beach, which is connected to the hotel by a funicular railway. This is a place for those who seek exclusivity and premium customer service, and want to spend their holidays in an upscale villa, a deluxe room or suite with marble bathrooms and breathtaking views. Every detail is taken care of so that you can enjoy a perfect morning breakfast in bed and sleep in an extra large, super-comfortable bed. Have you made up your mind? Check rates and availability for your stay at the Ritz-Carlton Abama Tenerife. Should you prefer to go on with your search, we still have many other hotels in Tenerife.